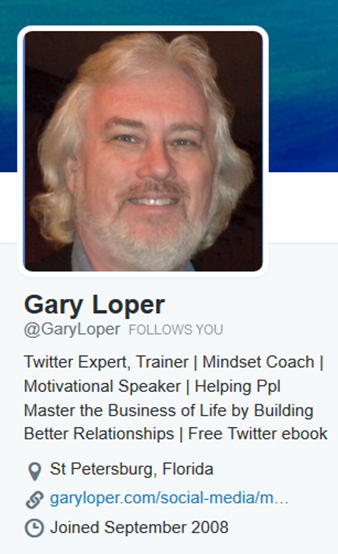 Gary Loper is a recognized Twitter Expert, Mindset Coach, Motivational Speaker, Trainer, former Talk Radio host, and life and business coach, a highly respected entrepreneur, Helping People Master the Business of Life. Gary has a strong background in marketing and sales, and his 30+ years of customer service and 15 years of direct sales adds more depth to who he is. With his diversity in spiritual studies, relationship building, life and business coaching, and marketing, customer service and sales, his background is a perfect blend to help others to be their best, in life and business. With more than 220,000 followers on Twitter he has built a huge following based on adding value to people’s lives, sharing his knowledge, beliefs and philosophies in his messages. He has incorporated into his platform ‘Just for Today’ messages, inspirational messages that have helped people renew their hope. Gary has worked with clients managing their Twitter Accounts, attracting a targeted audience and expanding their reach into the market as well as helping devise strategies of presence and engagement that has been the key element in shifting followers into fans, clients, and referral sources. One client regained 20 hours (time used in doing their own postings) after working with Gary in which they used that time to attract new business by engaging and connecting deeper with their followers. He specializes in working with coaches, speakers and authors, healing arts practitioners, artists and entrepreneurs. He teaches his audience strategies and tactics on how to become successful, to produce and maintain positive solutions, to stay in a positive mindset, and attract and manifest true wealth. Gary empowers people to discover their gifts, develop confidence and create better relationships with themselves and others in their lives.